Today is the appearance day of Sri Nityananda Prabhu. On this day, it often comes to my mind that Srila Prabhupada, our spiritual master and great, pure, perfect, all-merciful Vaisnava acarya, is the actual representative of Nityananda Prabhu and His mercy. Sri Nityananda is the original guru for all living entities in the entire universe. He is the most compassionate of all incarnations of the Supreme Lord. He even propitiates the savior of the fallen souls, Patita Pavana Lord Sri Caitanya, on our behalf. So, who could be more merciful than Nityananda Rama? Patita Pavana -- You are the savior of the most fallen, that must somehow include me... If we surrender unto the lotus feet of Lord Nityananda, in the proper mood of humility, with deep repentance, an open, receptive heart and submissiveness, then there is hope that Lord Caitanya may forgive our terrible imperfections and previous offenses -- to help us actually progress and one day become one of His eternal servants of the servants in the perfect spiritual world. At that time, we will always be happy. Even the most fallen ones become fortunate, by taking shelter of Lord Nityananda through His representative -- the all-perfect, most compassionate, dearmost carrier of Krishna's Divine Grace, Srila Prabhupada. Perhaps even I will be saved, too. This hope is giving us new light, it shines forth at the horizon, with all its grace, more pleasantly than the twinkling of pure star light, in the middle of the dark night. Let us go back home, to Krishna. The invitation is there, by inconceivable good fortune. Like a dwarf who is trying to reach out for the effulgent moon, or like a stammering idiot who is helplessly attempting to repeat sublime poetry, like a dirt-covered coal-miner who is looking at a pure, heavenly, crystal-clear lake of nectar, we are, yes, we are trying to reach out for that mercy, having no other shelter and suffering miserably from the pangs of this material world. Service to Srila Prabhupada, reduction of our offenses and becoming somehow useful, inspite of our incompetence and our hopelessly fallen nature, is the perfection we pray for, by praying to the lotus feet of Lord Nityananda. Lord, please let me become the dust at your feet, so that the mountains of dirt will finally be washed away from my heart, by the rivers of mercy, like profuse rain showers of nectar, of Your Divine Grace. 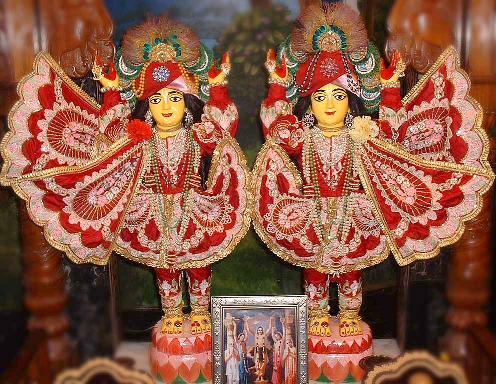 "...Heno nitai bine bhai: Unless one takes shelter under the shade of the lotus feet of Lord Nityananda, radha-krsna paite nai -- it will be very difficult for him to approach Radha-Krsna. The aim of this Krsna consciousness movement is to enable us to approach Radha-Krsna and associate with the Supreme Lord in His sublime pleasure dance. Narottama dasa Thakura advises that if one actually wants to enter into the dancing party of Radha-Krsna, he must accept the shelter of the lotus feet of Lord Nityananda..."
"...Narottama boro dukhi. Narottama dasa Thakura, the acarya, is taking the position that he is very unhappy. Actually, he is representing ourselves. He says, "My dear Lord, I am very unhappy." nitai more koro sukhi: "Therefore I am praying to Lord Nityananda to make me happy." Rakho ranga-caranera pasa: "Please keep me in a corner of Your lotus feet."